Hollister XS Long Sleeve Striped Shirt Black & White NWT Must Have Collection. Condition is New with tags. Shipped with USPS First Class Package. Gray/Black Striped SHIRT/TOP with COWL neck. It is in VERY GOOD gently used condition. MAIN COLOR: BLACK AND WHITE. MATERIAL: POLYESTER BLEND. CONDITION: NEW. 17" from armpit to armpit. Sleeves 19" long from the collar. Blue and black striped design, left chest pocket, 3/4 sleeves, super cute, nice overall condition. ITEM: Z005. STYLE: Long sleeve striped knit long sleeve top. COLOR: BLACK & WHITE soft knit flexible fabric. LENGTH FROM SHOULDER TO HEM: 26”. FEATURES: Full length sleeves, V-neck, Seam down the middle of the back. Shoulder seam to shoulder seam is 12.5". Sleeve length is 23.5". Length (back of collar to hem) is 11.5". 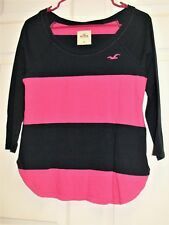 Hollister pink and black striped top with 3/4 sleeves. Shoulder Width: 17". Sleeve Length: 10 1/2". Length from the top of the back collar to the hem: 22". Cuffed 3/4 Sleeves. Excellent pre-owned condition. 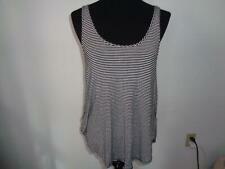 Hollister Black & White Striped Tank Top String Back Size Medium GUC Juniors. Condition is Pre-owned. Shipped with USPS First Class Package. Jeweled front. Arm pit to arm pit- 17". Length - (shorter in the front) 22.5 / 25". Super Cute Hollister Stretchy Fitted Striped Long Sleeve Top Size Small! Made of 61% polyester, 36% viscose, 3% elastane. Very Cute & Soft Top! Has buttons down the front but they are non-functional. Other Info Switzerland, and UK. Malaysia, Malta, Netherlands, New Zealand, Portugal, Singapore, Spain. Hollister XS Shirt Knit Striped Black Gray Long Sleeve. Sleeve 27 in. Length 28 in. Item: Hollister Stripy Tshirt Size L.
Black & White Stripe Hollister Top. Has Been Used ButSelling As Huge Clear out! Black & White Stripe Hollister Top. Has Been Used but selling As Huge Clear out!. Condition is Used. Dispatched with Royal Mail 1st Class. Really lovely soft fabric and in great condition! Slightly flared as shown so is super flattering when on. Striped In Black,White. logo bottom. Elasticated cuffs. STRETCH FIT. HOLLISTER TOP. Consider as well that the girl in the picture is 52 kilos/ 8 stones and is tall 177 cm / 5.8 feet. A signature will be required upon receipt. Having a massive clearout. Used but In great condition. Hand wash cold. Lining:100% Polyester. Do not dry clean. Low iron on reverse side. Tumble dry low. Slim Fit,lettuce edges,off-the-shoulder neckline. Machine wash cold, with like colors. Do not dry clean. ABERCROMBIE & FITCH. POLO TSHIRT. ALL BUTTONS STAMPED HOLLISTER. HOLLISTER LOGO ON TOP LEFT. DENIM BLUE / WHITE STRIPED. Our goods are all perfect unless stated as otherwise. SIZE SMALL. Black And White Striped Off The Shoulder Long Sleeved Top. Condition is Used. Dispatched with Royal Mail 1st Class.